More on that later.We got up late (again by Joshi’s standards) this morning and had a leisurely breakfast, tied our luggage to the bikes and took off by around 9AM. The road was supposed to be nice from now on, right ? Well almost ! While not as bad as what we’d been through, there were long sections of the road which were under repair and so the ride wasn’t as smooth as we’d been hoping. We still had a nice time but only because we’d seen worse. We stopped at the base of the Baralacha la pass to register ourselves at the police check post, had tea and refreshments and continued on. The climb to the pass was quite easy with excellent tarred roads and nice weather. 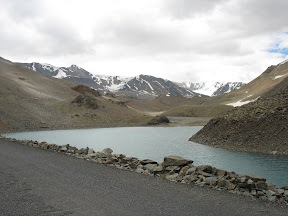 We crossed Suraj Tal on the way, which, is the source of the bhaga river. Thanks to the good roads, we would have missed Baralacha la if we hadn’t noticed the board. 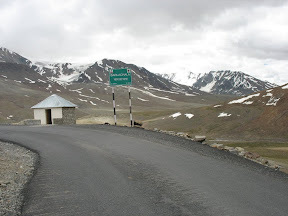 After all the stories we had heard about the pass being dangerous, this seemed too easy and actually disappointing, but hats off to the BRO for maintaining the roads in such inhospitable conditions. The pass was quite windy and after a small photo stop we all moved on. We climbed down the pass pretty fast and reached bharatpur which is just another collection of tents. A lot of people prefer staying here instead of going further to Sarchu cause its cheaper. We didn’t spend much time here and moved on since we had to reach Pang which is another 70 kms ahead of Sarchu and time wasn’t really on our side. The road was nice and inviting but quite bumpy and I, after a couple of bad bounces, took things easy and carried on at my own sweet pace. 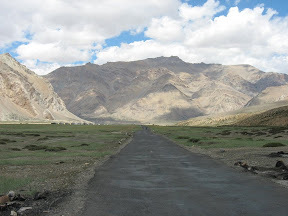 The bumps, I’m told, are because of the himalayan mermots that dig holes below the road’s surface and so the surface of the road sinks because of that. We had lunch a little after Sarchu at a place I can’t remember the name of. Lunch was pretty uneventful … couple of us had maggi and the rest daal chaawal towards the next challenge of the day, ghata loops. 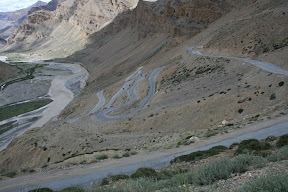 The loops are a series of 21 hairpin bends over a distance of approx 13 kms which would take us from a height of approx 13776 ft to 15302 ft. The loops can be quite a strain on the bike and the biker since after this the chances of hitting AMS are quite high. The idea is not too exert yourself too much after reaching the highest point and do what we did … take a couple of pics and move. 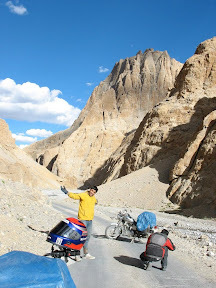 By this time Pandey was down with a pretty bad case of AMS, even though he wouldn’t admit 😉 We crossed two more passes today and all he would do wherever we stopped was lie down. It was quite a sight 🙂 This is at Nakeela. The passes themselves weren’t too hard. 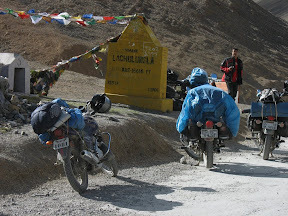 We crossed Nakeela (15547 ft) and Lachulungla (16616 ft). Didn’t spend much time on the passes. Pandey had AMS and Ashok also wasn’t feeling too well. 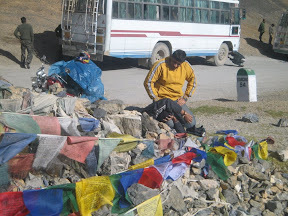 The roads were quite bad and we weren’t in a very good shape and quite desperate by now to reach Pang. So, we took the obligatory pics and moved on. Btw, in the pic below, if you see closely, you can see Pandey lying on the ground with his back against the board marking the pass. The scenery was pretty awesome and it would have been a waste not to stop for some photos. We were close to Pang now and were sure we’d reach in time, so we took easy from here on, taking quite a few breaks and clicking through our quota of pics for the day. Pang (15640 ft) is another small settlement which is basically a collection of tents with basic food and lodging facilities. 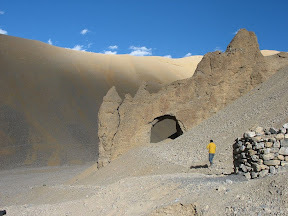 Even though, accommodation is available at Pang and it is closer to Leh, I’d still suggest one to stay at Sarchu since Pang is a lot higher than Sarchu and unless you’re acclimatised, its probably not a good idea to spend the night at this height. 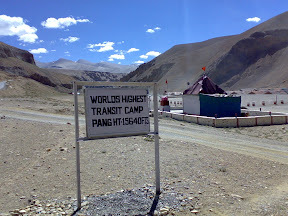 Pang, like I said earlier, has the world’s highest transit camp and this is where we were to spend the night. 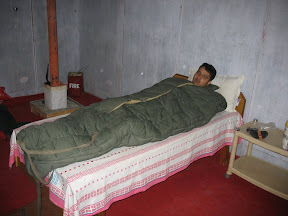 Pandey’s AMS was getting pretty bad and he went to sleep in his room as soon as we reached the transit camp. The rest of us unloaded our bikes and Amar and Ashok went to sleep and Joshi, Sandhu and I went for a walk around the camp and to make some calls from the STD booth. Felt nice walking on our feet after a whole day of riding. Its quite amazing that the Army has STD facility through a satellite for the troops at this isolated place. Pandey’s luggage was still on the bike when we came back, so we untied it and kept it in his room and decided to take Pandey to the Medical room at the camp, which as usual, he refused. But we persisted and he finally relented. The doctor gave him a 10 minute dose of pure oxygen and he was absolutely fine after that. He was back to his running, jumping self and looking at him, we all were in half a mind to get a couple of minutes of dose ourselves 🙂 Anyway, we went to the mess for dinner, saw news on TV after 10 days, had an awesome dinner and went back to our rooms. The rooms were nice and cosy and warm enough. It was freezing outside and we were tired so we went to sleep pretty soon after dinner. The sky outside was amazing. This sounds like a cliche, but I don’t think I’ve seen so many stars in my life ever ! Too bad, we didn’t have the energy to go to our rooms and get the cameras out. We had a nice sleep thanks to the sleeping bags in the room and didn’t really feel the cold. The site nomadicrider.com is excellent resource, respect, owner.